Rated 4.6 out of 5 stars.14 total votes. Clean lines, urban attitude, and popping colors define Latitude Run’s on-trend look, perfect for lofts and living rooms alike. When you buy a Latitude Run Amaryllis Adjustable Height Bar Stool online from Wayfair, we make it as easy as possible for you to find out when your product will be delivered. Read customer reviews and common Questions and Answers for Latitude Run Part #: LATU3827 on this page. If you have any questions about your purchase or any other product for sale, our customer service representatives are available to help. Whether you just want to buy a Latitude Run Amaryllis Adjustable Height Bar Stool or shop for your entire home, Wayfair has a zillion things home. I love these stools. They are so soft. Easy assembly. I bought the gray barstools on sale and absolutely love them. They were darker gray than I had expected, but it still works with my decor. Very easy to assemble. Soft, plush, luxe. The only things I don't like about them are (1) the ring at the base of the pole - it looks cheap, but it's hardly noticeable unless you look up close, and (2) the bottom of these stools don't have any protective pads - the bottom edges are rough - so you should buy those if you plan on using these on tile or hardwood floors. Love these stools! The cushions are comfy yet firm, they are so lightweight yet provide substantial support, and they take 10 minutes to assemble. Look exactly like the photos. They are elegant and gorgeous! Love my new stools the pink color is so neutral not mention how stylish and comfortable they are totally recommend this stools happy customer! Rated 4 out of 5 stars.488 total votes. Whether drawn up to your kitchen island to give your entourage a place to chat while you whip up a meal, or the perfect perch to share a drink in your entertainment ensemble, a stool like this is a great option for sleek contemporary style. Crafted from steel, it features a clean-lined square seat founded on a chrome-finished pedestal base. The swivel seat is wrapped in faux leather upholstery that features stitching detail for a sleek look. And thanks to the pneumatic lift, you can easily adjust this piece between counter and bar height. With its timeless design, elegant, curved shapes and a shiny chrome and imitation leather this barstool will make your cocktail hour a favourite meeting place. Now, cosy evenings in good company will be even more fun. This Whelan Low Back Adjustable Height Swivel Bar Stool will make an attractive statement in the home. 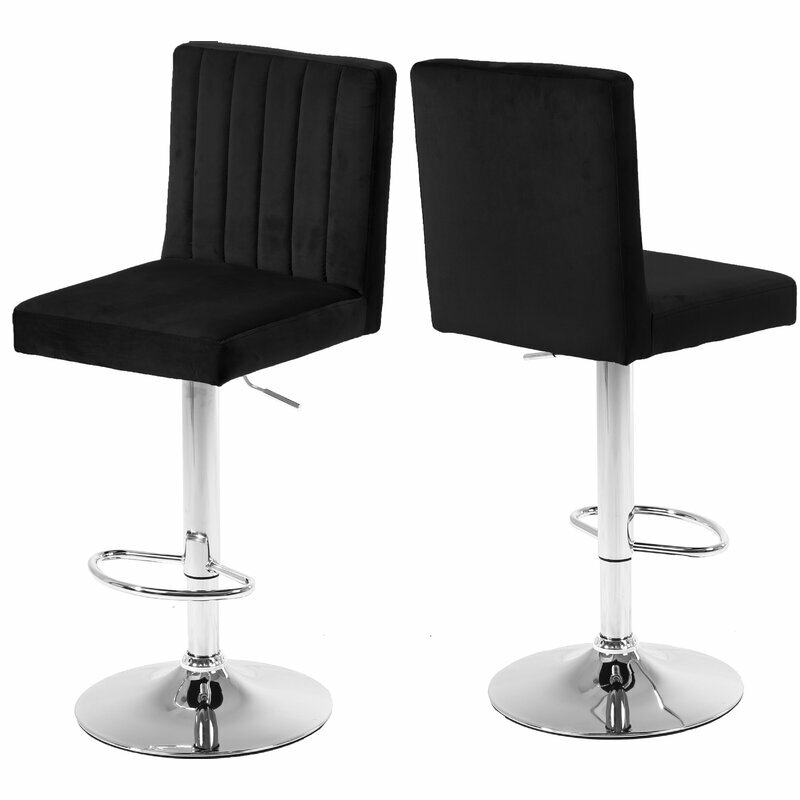 The height adjustable swivel seat adjusts from counter to bar height with the handle located below the seat. The chrome footrest supports your feet while also providing a contemporary chic design. To help protect your floors, the base features an embedded plastic ring. This Adjustable Height Swivel Bar Stool features a medium height seat design complete with armrests for optimal user comfort and support. The added footrest adds balance to the piece by serving as a visual accent to the plush, foam padded seat. This barstool's diamond textured, the faux leather seat features a Poplar wood base and 360-degree swivel function, allowing for a wide range of movement while seated. 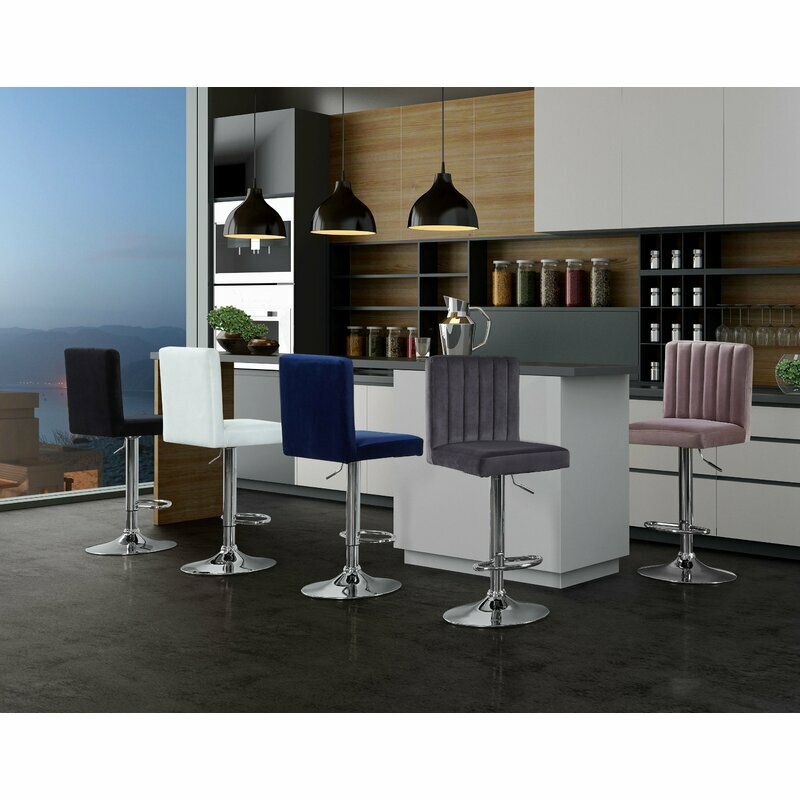 The adjustable height setting on the bottom of the seat allows one to easily transform the stool from counter to bar height, making it adaptable for both the kitchen and the home bar setting. A powder finished design with a sleek faux leather upholstered, black brushed wood seat as well as two chrome finish designs sporting stylish walnut wood seat frames. The swivel bar stool adds just the right touch of contemporary while offering the warmth of wood. With adjustable height for easy bar-to-counter maneuvering, the bar stool fits into any decor. Rated 4 out of 5 stars.203 total votes. Whether pulled up to a pub table or making your kitchen island more eye-catching, this bar stool is the perfect perch. Designed to fit the counter of your choice, it offers an adjustable height that can extend from 21'' up to 34.75'' tall. This piece is ideal for more modern ensembles, pairing a polished chrome-finished metal pedestal base with a low-back seat wrapped in non-fussy faux leather upholstery with a neutral gray hue. This Iacovelli Adjustable Height Swivel Bar Stool has a metal frame with a chrome finish, perfect to fit in with any existing contemporary decor. It's got a classic scooped seat with a comfortable, classic padded back, so you will love hanging out on this stool for sure. It's height easily adjusts with the easy-access bar, and it's got a footrest for added comfort.